When you choose to go on a rafting trip, you will relax, have fun, and enjoy some of the most beautiful views in the world. No other rivers have captured people’s hearts and imaginations like the mighty Colorado and her sisters, the Yampa and Green Rivers. From stunning 1.7 billion year-old black rock formations in Westwater Canyon to towering sandstone spires in Cataract Canyon and Canyonlands National Park, the scenery on our river trips is unparalleled. You can experience exciting whitewater or the serenity of calm stretches of river and will enjoy a worry-free environment that brings families, friends, and solo travelers alike together. 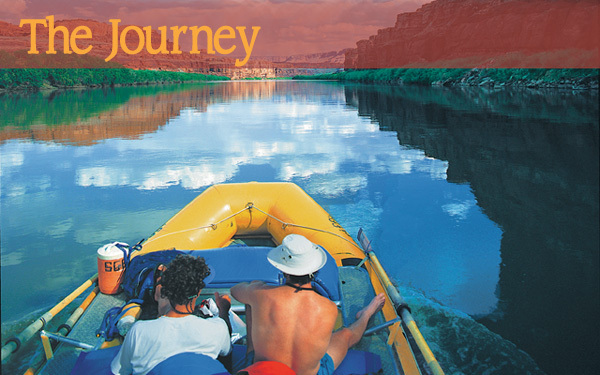 There are hidden amphitheatres, secret canyons, and ancient Native American petroglyphs and pictographs throughout the desert southwest that are only accessible by river; and a river rafting trip is one of the best (and only) ways to reach them. 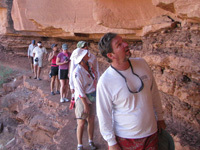 There are beautiful hikes of varying lengths on every Sheri Griffith River Expeditions trip. 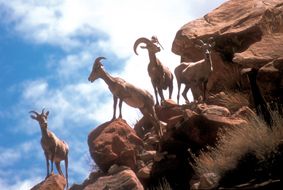 Whether you are looking for short, easy walks to interesting rock art or more strenuous hikes to impressive overlooks, our staff can help you select the right trip. And remember, all hikes on our trips are optional – so if you are feeling in a more relaxed mood on a particular day, no worries! Utah has some of the best whitewater rafting in the western United States, and Moab has long been the center of whitewater rafting within Utah, meaning you’ll have an unforgettable whitewater adventure! Cataract Canyon and Westwater Canyon, both of which are stretches of the Colorado River, are known for having the biggest and most exciting rapids in the region (up to Class IV+ depending on water levels). Westwater Canyon has 11 rapids with intimidating names like Skull, Funnel Falls, and Sock-it-to-Me; while Cataract Canyon has 28 named rapids (including the quick-succession Big Drop 1, Big Drop 2, and Big Drop 3). 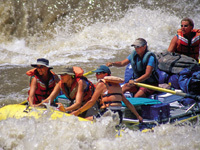 For those seeking something exciting but slightly calmer than the Colorado, our trips on the Yampa provide splashy Class II to Class III rapids. If whitewater is not really your thing, you should check out our trips on the Green River, which has the longest undammed stretch of flatwater in the southwest. These trips are perfect for families or those wishing to kayak a gorgeous flatwater stretch of river in stunning surroundings. At Sheri Griffith River Expeditions we pride ourselves on providing fresh, healthy, exciting, and locally-sourced meals on all of our river trips. We obtain all of our meats and cheeses at a small independent shop in Moab and strive to purchase the bulk of our produce at the farmer’s market or other local sources. For items that are difficult to find locally, we buy from small independent merchants whenever possible. We provide a variety of protein (both meat and vegetarian) options, and can accommodate a variety of diets. Last, but not least, our guides are great cooks and will do all the work while you relax and enjoy the beautiful surroundings in camp. You will wake up in the morning to the smell of fresh coffee brewing and your guides preparing a delicious hot breakfast. During breakfast your guides will inform you of that day’s plans and what you should put in your day bag. 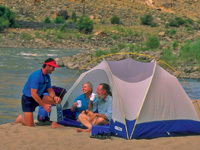 After enjoying breakfast you’ll pack up your personal belongings and SGRE staff will help you take down your tent if needed (the guides will also break down and pack all group gear). Once everyone is packed and ready you’ll board the rafts and head downstream. 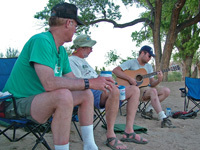 Most mornings will include a stop in a scenic location, for a short hike, or short stops to scout big rapids (depending on what type of trip you are on). 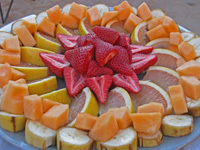 All trips include a stop mid-day to enjoy a healthy lunch served in a beautiful riverside location. Most afternoons will also include a stop in a scenic location, for a short hike, or short stops to scout big rapids (depending on what type of trip you are on). By mid afternoon we will have reached our camp for the evening. Your guides will unload the group gear and start setting up our camp while you have free time to relax and enjoy the beautiful surroundings. Most afternoons you’ll have time to go on a short walk, read, or do activities before appetizers and dinner (which your guides will prepare). After dinner you’ll have the opportunity to enjoy the camaraderie of your guides and fellow travelers while we all collectively recall the adventures of the day and look forward to tomorrow.